István Király V.: Library Secret Fonds and the Competition of Societies by István Király V.
I am Professor Associate at the Hungarian Department of Philosophy of the Babes-Bolyai University, Cluj, Romania. Between 1995 and June 2015 I was the Chief editor of the journal Philobiblon - Transylvanian Journal of Multidisciplinary Research in Humanities. The main fields of my philosophical interest are the subjects of the Secret and the Death. Library Secret Fonds and the Competition of Societies by István Király V.
The competition between the socialist / Communist social system and the capitalist social system elicited a need for secrecy. This ideological battle took place during the Cold War, which is conceptually defined as "the unarmed development of a competition between antagonistic social systems" where the goal is to "suppress" or "liquidate" the competition. This organized secrecy played a part in structuring life within each of these systems. The secret collections in Romanian libraries consisting of banned books contributed directly to this secrecy. Library secret fonds were used to control the circulation of information within a system or throughout other systems. These prohibited materials were withdrawn from circulation and kept confidential. Libraries kept lists of these fonds separate from the regular collection, and these lists were kept and up­dated throughout the years. During the Communist regime in Romania, the lists of forbidden books were considered "an efficient instrument for the political struggles from the inside of the Communist party." 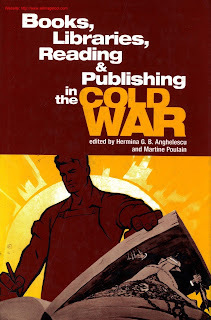 Library secret fonds are a symbol of the antagonism between the two political systems of the Cold War.